Commercial fishing is, well, commercial, and commercial fishermen constantly seek any advantages that will provide more fish per hour or dollar expended. One way for commercial hook and line fishermen to add “labor” without adding salaries is to “hire” automatic jigging machines. Fish caught individually this way also may be worth more on the market, as they are not dragged around and damaged as in some net fisheries. Automatic jigging machines also are environmentally friendly because little bycatch is killed, as occurs in so many other commercial fisheries, where the wrong fish also are caught and injured in the process. These electrically or hydraulically powered machines have strong line wound on large-spool reels, which are mounted on short, stout rods. 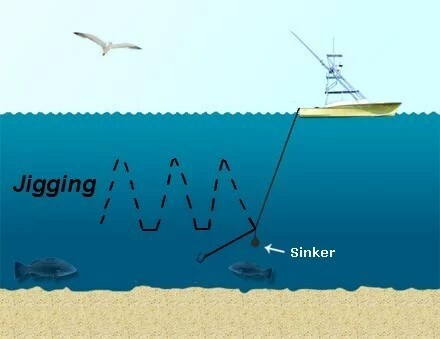 Unlike traditional handlines, best fished one line per fisherman, an operator can work three jigging machines at once. In Iceland, forty-foot double-ended Norwegian high-sided trawlers have been outfitted with automatic jigging machines spaced three feet apart. When a jigging machine’s line hits bottom, it goes slack and then is lifted about two feet. When it loads up with hooked fish that exceed a certain threshold of tension, the machine automatically hauls them up. In a test comparison in Alaska between a single automatic jigging machine and a standard halibut longline, the jigging machine generated more raw poundage of fish, although the longline produced more marketable poundage. The jigging machine caught Lingcod, Pollock, Pacific Cod, and four kinds of rockfish. When it fished six lures simultaneously, it harvested fish at the impressive rate of eleven hundred pounds per hour, even though about half the time was lost in repositioning the boat over productive bottom.